Home news Facebook Nurse-in Protests A HUGE Success Worldwide! Facebook Nurse-in Protests A HUGE Success Worldwide! As we reported earlier, Mothers around the world, angry and upset that Facebook was censoring their breast-feeding photos and even suspending their Facebook accounts, organized a world wide nurse-in protest on Monday that now, by most accounts, seems to have been wildly successful! The mothers went to the nearest Facebook office and nursed their babies by breast feeding them outside the Facebook offices to stage this Facebook “Nurse-ins” protest. The biggest such “nurse-in” took place outside the company’s new Menlo Park headquarters here in Silicon Valley in California. Nurse-ins were also staged in various Facebook satellite offices around the world, check the location specific facebook page here for updates on the “nurse-ins” there. Hundreds of mothers made it the Facebook HQ to participate in the protest. Jodine Chase, who organized the “nurse-in” protest for the Facebook HQ (Menlo Park) told SFGate. There’s no excuse for anyone to be harassed for breastfeeding. We want Facebook to leave breastfeeding alone. 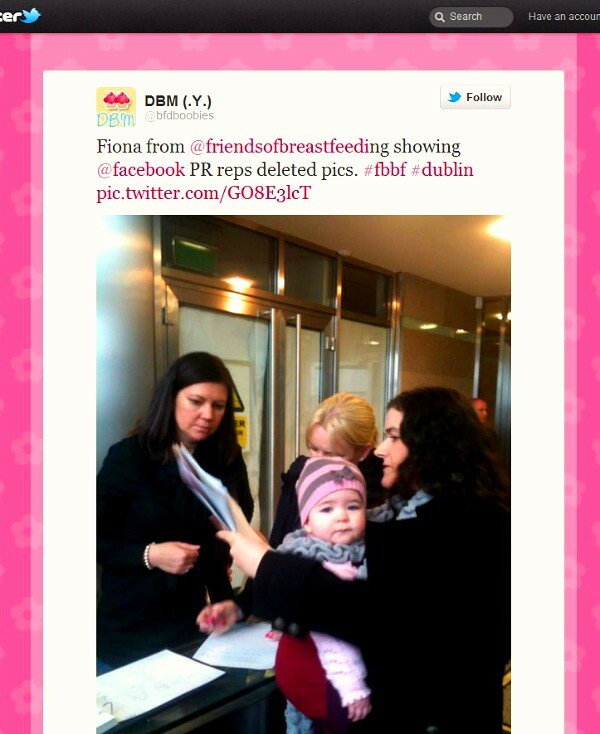 In Ireland, The Irish Times posted a video report in which the breast feeding mothers held a press conference. Chris Finn from Friends of Breastfeeding said. These pictures might not be even visible to anyone other than the person and their friends. Yes they are being removed. And people are being threatened with having their accounts deleted. Suspended. The most important thing I want to say to you is we wish we weren’t here today.We wish we didn’t need to be here today. Breast feeding should be such a non-issue. It’s only feeding a baby so what’s the big deal. It’s only a big deal because of people who don’t understand this. Meanwhile, down under in Sydney, Australia, the protests saw big turn out too, with mothers nursing their babies outside the Facebook office in Syndney. Yahoo news covered this event (see video here. requires adobe flash). Lucy Allen, nurse-in organizer in Sydney, said why she was there. When there is a child attached to the breast we are told that it is a shameful act. And that we need to hide it away and that those photos will be removed and we’ll be punished for posting them. Back in the Menlo Park HQ, protesting mothers showed Facebook’s PR reps all the photos that Facebook had deleted and how they suspended their accounts for posting the breast-feeding photos. One Response to "Facebook Nurse-in Protests A HUGE Success Worldwide!"